Clay Chimney Caps - Portland Stone Ware Co., Inc. Here are more options from Superior Clay to improve any fireplace. Due to the various sizes and options, these items are special orders. PSW customers please contact us for quotes and lead times for any item from these three product lines. Whether you aspire to recreate the feel of the Victorian era or want to finish your chimney with the clean, simple lines of a classic chimney pot, Superior Clay can help. 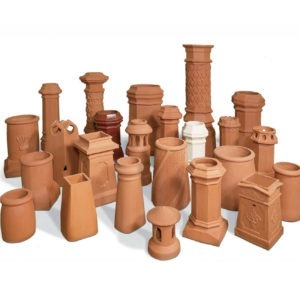 With more than 60 standard chimney pot styles to choose from, and a variety of ways to customize your chimney pot, we can help you find the look that’s just right for your home. Properly sized Superior Clay chimney pots will not only add beauty to your home, but will add height to your chimney. There are several factors that play a role in selecting the right chimney pot for your home.